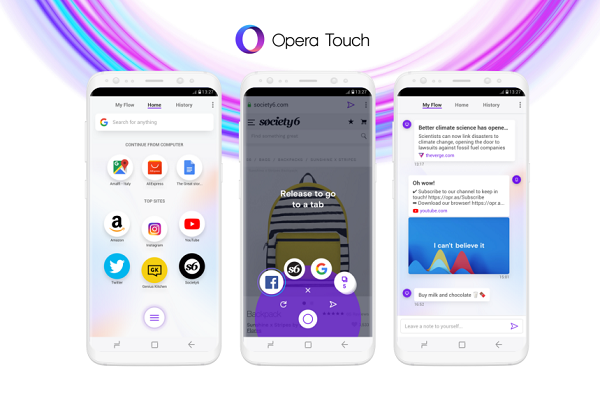 Opera Touch browser launches for Android, iOS app coming soon. Opera has today launched Opera Touch, a brand new mobile browser designed to be used on the move with just one hand. Opera Touch also makes the mobile and desktop web browsing experiences into one with a feature named Flow. Opera Touch is a free app available for Android on Google Play and will be coming to iOS soon. To make full use of the Flow feature, download the latest Opera browser to your Windows, Mac or Linux PC. Opera Touch browser designed to instantly search the web. Created for convenient use with one hand and for you to share things with your Opera Browser for PCs via the Flow feature. Opera Touch lets you explore the web using just one hand. The Fast Action Button (FAB) is always available on your browser screen and gives you direct access to your Instant Search. You can also hold and swipe the button to switch to your most recent tabs, reload, close or send the current tab to your computer. Opera Touch employs the very latest in web technologies to keep you safe. The data you send in Flow is fully end-to-end encrypted. The browser also features Opera's cryptojacking protection, which reduces the risk of your mobile getting overheated or running out of battery when you browse the web.